Because I see you, hungry reader whose life is crazy right now, who has a hard time finding the time to cook even though you love food, who opens the fridge to grab a quick lunch to take to work in the morning rush only to find NOTHING that seems good enough, who made New Year’s resolutions to eat healthier that have gone by the wayside since that self-gifted box(es) of chocolates for Valentine’s Day, who values the big bowl of comfort food pasta above all else, who is not asking for much other than GOOD FOOD that is made for REAL LIFE. I see you. I know you think I’m not watching because I’m on the other side of this computer-ma-jig, but I’m watching (um, in a not-creepy and not-literal way – just felt like I should clarify. pls don’t leave.). So since I see you and understand you because I am just like you in these feelings, today I honor you (us?) with this super cozy, big-time nutritious, easy to prepare soup. 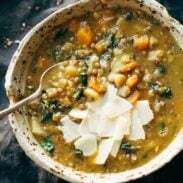 This is called Detox Crockpot Lentil Soup, which means nothing scientifically as you’ll notice that my bowl of DETOX soup is topped with a few thick chunks of Parmesan cheese and served with that addicting crusty-warm miche bread. Right, about that. We did sneak a few detox foods into this soup (kale, onions, garlic, carrots, and olive oil) and anyways, in my book, the best kinds of detox foods are the ones that ACTUALLY TASTE GOOD. And while this soup tastes good without the extras, it tastes BETTER with them. Cue the bread and cheese. As is my goal with most recipes I make for Pinch of Yum, this crockpot lentil soup was made for real life. Because it’s literally for my real life. We’re starting with a solid base: onions, garlic, carrots, celery, spices, salt, and broth. Then we’re getting awesome by adding butternut squash, which partially melts into a creamy textured miracle, lentils (always lentils), and yellow split peas because WOW color. After all this simmers up into the best house smells and then we do the magic thing that takes it over the top: puree a portion of the soup with that olive oil to form a velvety emulsion that then gets added back into the soup. YES PLZ 4EVR. I ended mine with a spash of sherry and red wine vinegar because I’m currently having a moment with tangy foods. That’s it. That’s the soup. It requires a bit of front-end chopping to prep the veggies, but I’d guess it took me 30-45 minutes to cut everything up and get it in the crockpot, and in return I was gifted with 8 soup servings of this nutritious + cozy wonderfood. NOT A BAD DEAL. Instant Pot: Place same first group of ingredients in the Instant Pot and cook on the soup setting for 30 mins with a quick release. Follow the same blending instructions and then add kale and parsley. i love that you put tons of veggies in here, and added a bit of parm at the end (detox without balance is plain sad). Love the recipes, but would love the nutritional information. I am diabetic and it is important info. Sorry 😁 my eyes were still asleep. Wow I cannot wait to try this detox soup. It looks yummy!!! I always keep a can of Amy’s Organic Lentil Stew in my pantry for days when I just can’t seem to get dinner together. Keeping some of this in the freezer looks like an even better idea! I suggest seeing a doctor because it sounds like you’re having severe lived problems. Your liver removes all toxins/bad stuff for you, so if you’re having to “detox” yourself, your liver is probably failing. Wooww that’s not at all what this is talking about but okay. And hello there are plenty of toxins we expose our bodies to on a daily basis that your liver is unable to fully filter out no matter how healthy it is. Eating good healthy food does actually help with that. It boosts your liver as well as your digestive and immune system. Don’t comment on something just for the sake of being rude. The recipe looks lovely, but it should not be described as ‘detox’. Haha agreed. The ‘detox’ gimmick has gone too far. On another note, I made this soup and it is divine, even without the promise of ‘inner purity’. This is the best soup ever I tried and I am a lentil lover wow. Christy, if you don’t like it just leave instead of being smarty pants. You are not just rude you are uneducated because if you know the nutrition value of lentils you will say something like that. Christy, you seem to be one of those people who assume a little bit of knowledge gives you full knowledge. It doesn’t. It should just make you want to learn more. If you don’t follow up and learn nothing more, you were better off not knowing anything at all. I suggest you see a doctor because perhaps your brain is failing. Just because she called the soup “detox” does not mean she thinks she is detoxing her body. Back on subject: soup sounds amazing. Can’t wait to try It. This recipe looks delish and I have most ingredients already. Did you use dry lentils and split peas? Thx! My comment was in regards to Christys comment! This recipe was wonderful! ThankYou! “If you can’t say something nice, don’t say nothin’ at all…” (Bambi, 1942). Looking forward to healthy hearty lentil soup lunches this week. I made a similar soup but with loads and loads of garlic ! It is for sure a detox..lovey anything veggies and green’s! This looks so cosy. I love soups with split peas in them as they’re so satisfying and filling even without the bread. But of course the bread makes everything better and the cheese is just a no-brainer! Gorgeous photos as always! Thoughts on using sweet potatoes instead of regular? I have a few that probably need used up before I buy more potatoes. Did you end up using sweet potatoes? I am also wondering if using them would be okay, they are my favorite. I made using sweet potato instead of squash and it was DELICIOUS!! That’s me sorted for tonight then!!! I was thinking about using sweet potatoes as i don’t have squash in the fridge today. thanks! I can’t wait to make this soup. It’s got everything I love to eat. I plan to pair it with a loaf of 5 minute Artisan bread and of course the cheese. Thank you for sharing. I made the soup with rutabaga, a.low calorie, healthy substitute for white potatoes. Just discovering this alternative which held together in the soup. The soup is delicious. Can you tell me how to make that vegan parm?? Sounds delicious, and I’ve got almonds and nutritional yeast in my pantry right now! Love the soup bowl? Where can I get something like that? Yes! Where are these bowls from? Please tell – I’ve been searching all over the internet for them! Your photos are always such a pleasant thing to wake up to! Love this soup! So much. This may be a silly question, but should dry beans or canned beans be used? I assumed dried but want to be sure before I ruin dinner for all of us! Can’t wait to try this! I have the same question… did you receive a response? I usually soak beans first as, well you know what they can do to your system without soaking. Did anyone soak first? I’m wondering the same. Does the cook time change if I soak the lentils the night before? Or is that not necessary when cooking in crock pot? Split peas and lentils do not require soaking. While not a have-to, pretty much all grains and legumes get soaked at my house. I would soak in salted water, rinse well, and proceed with the recipe. You might want to go with the lesser cooking time, but crockpots can vary so much anyway. I didn’t soak the lentils and split peas but I think I will next time. And yes, the soup was delicious and definitely there will be a next time! The dried legumes were still a bit crunchy after 8 hours in the crockpot so I’ll try soaking them first. Hi Lindsay, love your blog. This soup is right up my alley and it’s on my “make soon” list. Any idea how large each serving would be? Looks easy enough! I’m hoping to prep this tonight for dinner tomororw, but I have sweet potatoes at home. Think they could be used instead of the regular potatoes or butternut squash? what would be the best kind of potato to use.. I am guessing Russet but for some reason I can never remember and the ones I use turn a funny colour when I use them in soup. This looks amazing! I have never tried a lentil soup in the crock pot. I make butter bean soup in the slow cooker which is amazing. Funny too that I just reposted it last night with new pictures. http://www.homeecathome.com/the-home-economist/slow-cooker-butter-bean-soup You would die if you saw the old picture. It was seriously bad! I will have to put this soup on my “to make” list. Funny! but I’m sure I wouldn’t laugh – I’ve taken some bad pictures in my day, too. 🙂 Thanks for the comment Faith! yes!! you will love it, Jasmin! 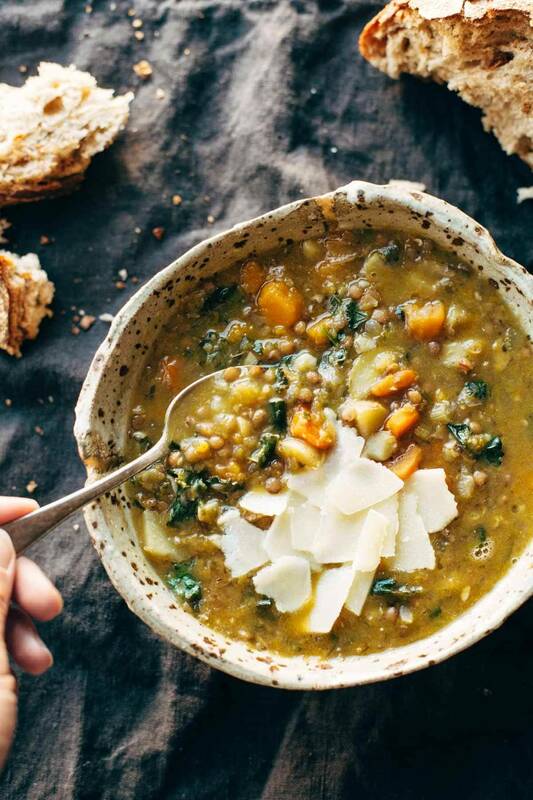 My obsession with lentils is strong lately so this soup is calling my name. Just finished this recipe at 3:30am because when I came across it on Facebook it was about 4pm and I couldn’t wait to try it because it looked so good! I mist say it came out delicious! Well worth waking up in the middle of the night! I’m also obsessed with lentil soup and split pea soup and was afraid to learn the recipe because I knew I’d be making it all the time. We’ll, I already can’t wait to make this delicious soup again! Wow! Glad to hear it, Nicole! I so want to try this! My problem is that with my work schedule I’m usually out of the house for at least 9 hours, sometimes more, and most things in the crockpot turn to mush by then. Any suggestions? Do you think this dish will hold up for that long? I use a light timer to turn on and turn off crockpot so food does not get mushy or over cooked. This is why I read the comments section. I never would have thought of using a light timer; thank you so much. Ohhh…a light timer..that’s clever..I like that. Do you have a crockpot with a timer? Mine will switch to “Keep Warm” after the cooking time. I use it ALL the time! I actually had an issue with the lentils and split peas getting soft, even after 7 hours and wound up leaving it cooking all night long! I turned it down to super low (I have temperature settings, not low/high) and it was fine in the morning. We didn’t eat that night and are about to dig in tonight! Cue bread and cheese ALWAYS! Love that shot of the peas & lentils, so beautiful! This is EXACTLY the sort of thing I want to come home to after a long day in the lab. Crusty bread and cheesy topping a must. This looks amazing! Would this freeze well? I have a bag of lentils burning a hole in my pantry and was going to make classic Greek lentil soup this week–change of plans!! 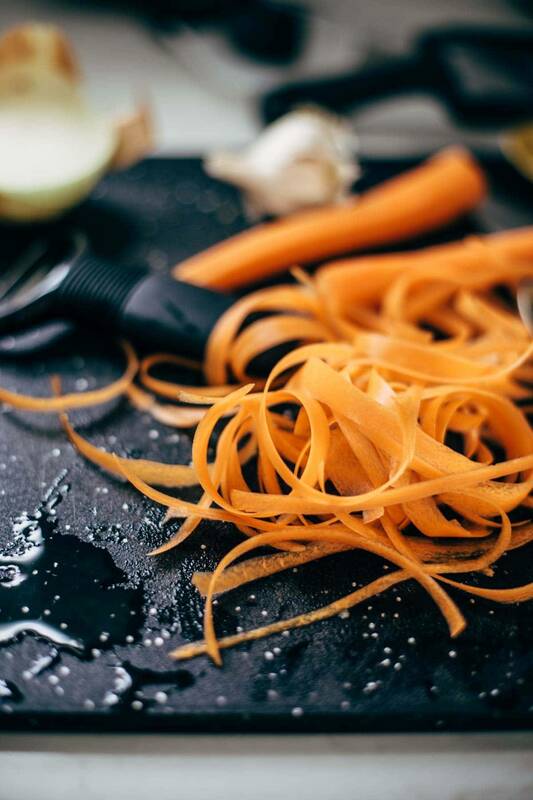 Thoughts on using frozen butternut squash for this? I have a bag that I’ve had for MONTHS, but I’m worried it’ll water down the soup too much. And since everything goes in at once, I’m worried I won’t be able to adjust for the extra moisture (if there is any). Thanks in advance! Oh, and with regards to the extra moisture, you could just cut out a cup or two of liquid and then add more if needed! Served with shaved parm and rye Wasa crackers. SO GOOD!! Thank you again!